After recording a screencast and inserting it into your story, you can edit and fine tune it. These methods will differ, depending on how you inserted the screen recording: either as a Video on a single slide or as a series of Step-by-step slides. If you inserted a screen recording as a video on a single slide, you can adjust its properties as you would any other video in Storyline. For example, you can specify how it will play (Automatically, When clicked, or From trigger), whether it will have a separate playbar or not, and its relative volume. Select the video placeholder on the slide, and then click the Options tab on the toolbar. To learn more about adjusting video properties, take a look at this tutorial. You can also use the built-in video editor to trim, crop, adjust brightness and contrast, add a logo or watermark, and change quality settings. Simply right-click the video placeholder, and select Edit Video. 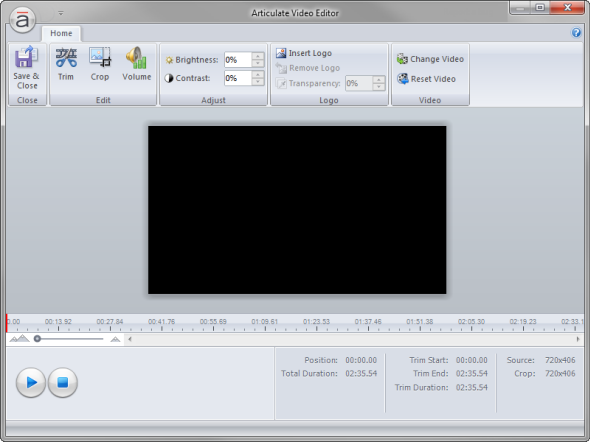 To learn how to use the video editor, click here. After inserting a screen recording into your story as step-by-step slides, you can add, edit, and delete slides as usual, and you can modify the captions, hotspots, data entry fields, feedback layers, and mouse movements that Storyline automatically generated for you during the recording process. You can also add objects to each slide in your step-by-step recording if you want. For example, if you need to hide a portion of the screen that appears in your recording, such as personal information or an advertisement, you may be able to cover that area with an image or a shape that matches the background color of the slide. Note that you may need to use the same image or shape on multiple slides if the portion of the screen that you want to hide spans a series of slides in your step-by-step recording. Navigate to the slide in your step-by-step recording that you want to modify. Right-click anywhere on the slide, and select Action Fine Tuning from the shortcut menu that appears. 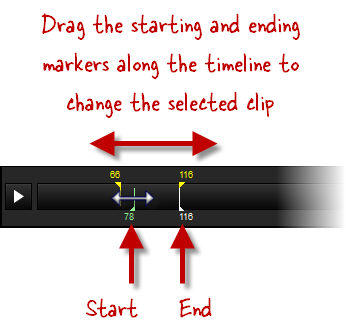 The quickest way is to drag the starting and ending markers along the timeline until you have selected the clip you want to keep. 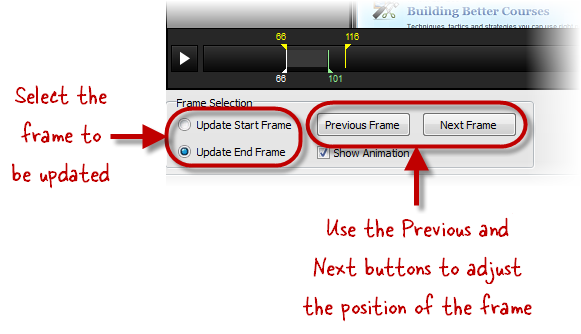 Or, for even greater precision, select either the Update Start Frame radio button or the Update End Frame radio button in the lower left corner, and then click the Previous Frame button or Next Frame button to move the starting or ending point along the timeline one frame at a time. You can use the Play / Pause button to preview what the slide will look like with your changes. If you change your mind about modifying the starting and ending frames, you can click the Reset Original Timing button in the lower right corner to undo your changes. If you need to make changes to other slides while you're in the Action Fine Tuning editor, you can use the slide drop-down list at the top of the window or click the Previous Slide and Next Slide buttons. When you've finished making changes to your recording, click the OK button to close the fine tuning editor.